Alumnus Brendan Reilly, above, with Eon Reality Sports. Imagine you’re a college football coach. You make your players watch game film, spend hours in the gym, and run no-tackle scrimmages in the July heat. But how do you teach the one thing that matters most—instincts? That’s where Brendan Reilly, M.S. ’11, comes in. Reilly is cofounder of Eon Reality Sports, a leader in virtual reality that’s created a new 3-D football simulator to train athletes. It allows a quarterback to stand inside a small space, surrounded by a virtual football field where digital linebackers come at him full speed. Think of it as a giant and much smarter version of a Madden video game, but one you play with your whole body. It’s a game-changing training tool, and one that might not exist if Reilly hadn’t gotten his master’s degree in sport management at Illinois State. When Reilly came to ISU in 2009 to work under then-basketball coach Tim Jankovich, he was already on the fast-track to becoming a head college coach himself someday. But he had this idea that nagged at him when he watched the Redbirds practice: Why aren’t these players using virtual reality to get even better? In class, Reilly’s entrepreneurial spirit was unleashed. He once gave a presentation to a group of owners arguing that putting a minor league hockey team in Las Vegas was a good idea. He loved it. “It was then when I realized I liked the business side of sports more than the actual game itself,” Reilly said. EON Reality Sports Football Simulator Sneak Preview from EON Reality on Vimeo. Illinois State’s sports pantheon is larger than Doug Collins ’73, or any other student-athlete. Reilly is just one of the many all-stars on Illinois State’s roster of alums who’ve found off-the-field success in sports—a Redbird network that grows more influential each year as the Department of Kinesiology and Recreation’s sport management program trains the next generation of leaders. These alums have varied backgrounds, from broadcasting to finance to family and consumer sciences. Yes, they say, working in sports is fun, but for reasons that oftentimes don’t have anything to do with wins and losses. Collectively, they share a competitive passion for sports that goes beyond fandom. Reilly, for example, spent six months researching his virtual reality idea, making phone calls around the world to see if anyone was already doing it, and getting encouragement along the way from his ISU sport management professors Nels Popp and Chad McEvoy. Eventually he formed a partnership with Eon, a longtime leader in virtual reality training programs in several other industries, just not sports. But his sweat equity is paying off: Earlier this year, Eon announced the University of Kansas—led by former Redbird Athletics Director Sheahon Zenger—will be the first NCAA institution to use its virtual reality football simulator. Unlike Reilly, Andrea Burke ’02 never saw herself working in sports. She studied human development and family resources at Illinois State, but after an internship she found that path wasn’t the right fit. Illinois State alumna Andrea Burke at Wrigley Field. She always liked sports—and going to Wrigley Field—so she took a chance and applied for a Chicago Cubs internship during what turned out to be an exciting 2003 season. One of the Cubs executives she met during her internship interview was Jay Blunk ’86, who is now executive vice president for the Chicago Blackhawks. That internship turned into a job, and 10 years later Burke is a senior account executive for the Cubs, going to work every day under the historic Wrigley marquee and spending her summers staring at the ivy. She was even able to take her grandmother, a die-hard Cubbie fan, to a game and down to the field during the 2004 season. But it’s not all perks. Working for such a unique team requires Burke to think outside the box with her corporate partners, who are looking to increase their brand exposure in a landmarked stadium with limited space. It’s up to Burke to strategically add signage and find other solutions. “ISU made me a well-rounded person and gave me the confidence to be successful in anything,” she said. 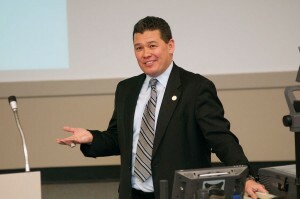 Eric Hart ’90, M.S. ’92, also credits the broad-based education he received at ISU for his sports career. 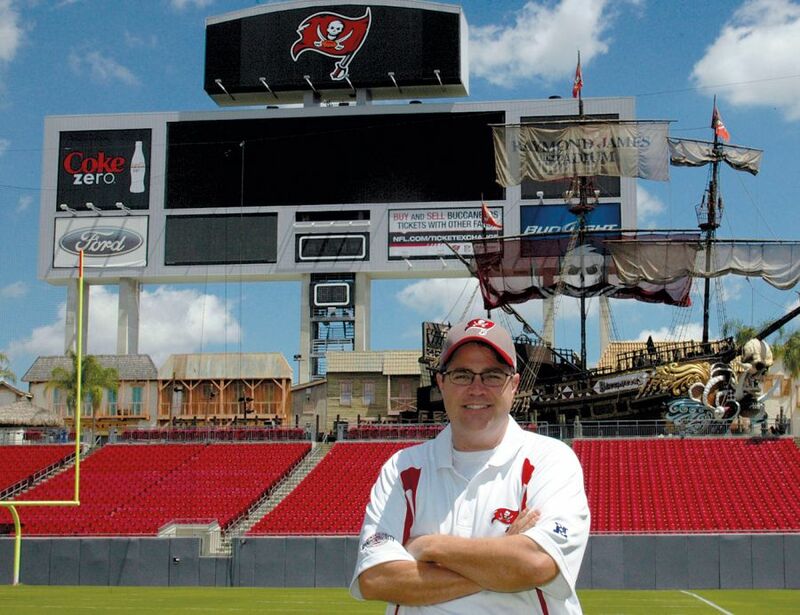 Alum Eric Hart is president and CEO of the Tampa Sports Authority. 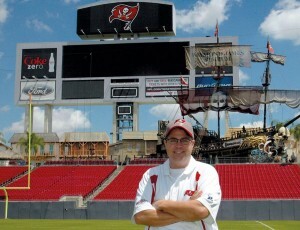 Hart is president and CEO of the Tampa Sports Authority, putting him in charge of Raymond James Stadium (home of the NFL’s Buccaneers), the Tampa Bay Times Forum (home of the NHL’s Lightning), Steinbrenner Field (home to New York Yankees spring training), and three City of Tampa golf courses. It’s his finance degree that’s gotten him this far. Turns out the guy who runs big venues like these—and a $38 million budget—needs to know about public financing, balance sheets, and income statements. Knowledge in event and facility management is equally essential experience that Hart picked up starting at ISU, where he worked the box office and concerts. He’s now positioned on a much bigger stage, where he relishes that every day brings something different. Raymond James can fit 75,000 people. On game days, the stadium becomes its own city, complete with police officers, medical personnel, and parking staff. That means football Sundays have lost their glimmer for Hart. And while he can enjoy sports on TV, he tends to get distracted when he visits other venues, scoping out their crowd control measures or something else more than the athletic competition. But there are no complaints from Hart, as running an NFL stadium has been his dream job—the “crown jewel” of facility management, as he puts it. The excitement of sports still hasn’t worn off for Mike Bucek ’82, despite three decades in the business. 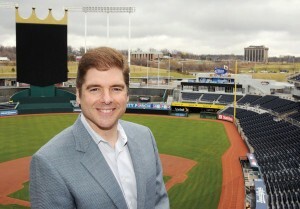 Alum Mike Bucek is vice president for marketing and business development with the Kansas City Royals. Bucek is vice president for marketing and business development with the Kansas City Royals, overseeing about 45 people who do everything from game presentation to corporate sales. He got his start in broadcasting as one of the founding fathers of Illinois State’s WZND radio station. His first job out of college, with a triple-A baseball team in Arizona, melded his two passions—broadcasting and sports. But the team’s small, everybody-does-everything staff also meant he was learning the whole business, a crash course in adaptability that’s paid off as he’s moved up the ladder. After Arizona, Bucek directed marketing for the Chicago White Sox, lead ballpark development for the Milwaukee Brewers, headed up sales and business development for the Indy Racing League, and served as chief marketing officer for the Phoenix Coyotes hockey team. In 2009 he joined the Royals, and last year he managed to boost ticket and corporate revenue while also selling out All-Star Game festivities. One of the many quirks about working in sports is that, unlike the marketing chief for, say, Gatorade or Pepsi, there are aspects of Bucek’s product that are completely out of his hands. “I can’t control the weather, and I certainly can’t control the team’s performance,” Bucek said. When the Brewers hired him in 1996 to help them build a new ballpark, all they had were a set of drawings and a parking lot. When he finished, they had one of the best venues in sports. As the Brewers’ vice president of ballpark development, Bucek slept with a yellow notepad on his nightstand for six years, kicking around ideas for financing, concessions, design, and everything else that goes into building a $400 million, 41,900-seat stadium. Bucek was even the one who pitched the Miller brewing company on buying the retractable-roof ballpark’s naming rights. It was an all-consuming job, but a once-in-a-lifetime opportunity that Bucek savored. Alumna Kelby Weiter is director of communications and marketing for Old Hat Creative. Kelby Weiter, M.S. 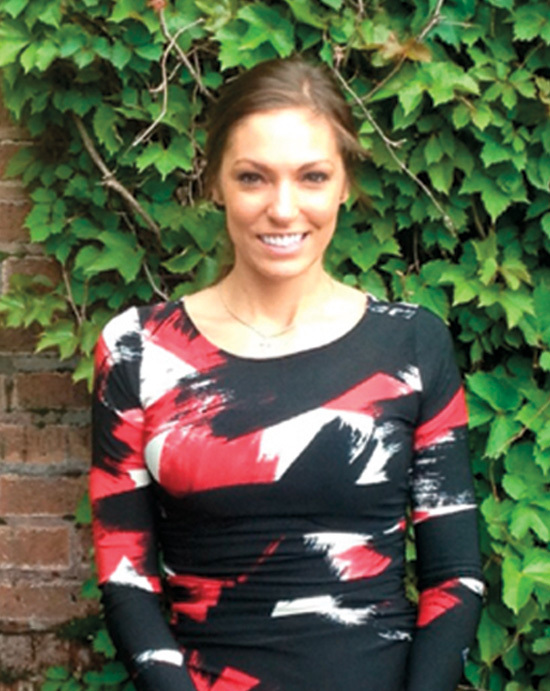 ’12, has spent her first year in the sports business building something from the ground up. 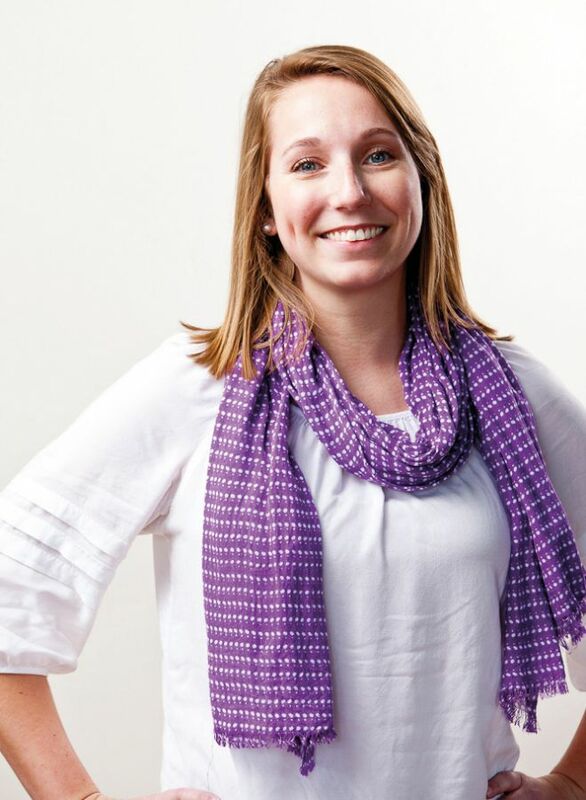 She’s the first director of communications and marketing for Old Hat Creative, a sports marketing agency that does print materials, videos, and websites for more than 80 collegiate programs and professional teams. Weiter’s father encouraged her to consider marketing as a career, so she chose sports and came to ISU for its sport management program. As a graduate assistant, Weiter helped lead a major expansion of the Reggie Kids Club program in Redbird Athletics—from 100 kids to 2,000 in just one year. Now she’s helping spread the word about her Oklahoma-based agency’s collegiate projects, including one last fall that sent her on the field before Texas A&M football’s home opener against Florida. “It was the excitement of it, being on the field, seeing the stands,” she said. Those who work in sports have careers full of big moments like that. For White Sox senior director of ticket sales and premium seating Tom Sheridan ’90, the most memorable was Game 3 of his team’s 2005 playoff series against Boston. A feared Chicago pitcher nicknamed “El Duque” came out of the bullpen and single-handedly silenced the rowdy Fenway Park crowd—and the rallying Red Sox. “It was just a magical point in time,” he said, especially given the White Sox went on to win the World Series. White Sox senior director of ticket sales and premium seating Tom Sheridan. Sheridan, a public relations major who played baseball at Illinois State, was conflicted about whether to take the first job that came along after graduation or wait for one in sports. He took the non-sports job, poaching engineers for a recruiting firm—and hated it. So he switched gears and followed his passion, taking low-paying internships with the Chicago Bulls and White Sox before the Sox offered him a job. The sports industry, particularly in Chicago, is “smaller than you think” and connections are key, Sheridan told School of Communication students during last semester’s Communications Week. Just like Bucek, Sheridan says that some things in sports are out of your control. Trades, for example, can have a noticeable effect on ticket sales—good or bad. Now in his 19th season with the Sox, the former athlete is happy he followed his passion for sports beyond the base paths.